Well, it’s BALMY in BOSTON. I think that we’re at around 80 deg F and 80% humidity. SOUPY. I feel like I am sticking to everything, and that’s not only a result of my poor housekeeping skills. Has anyone else noticed that it’s difficult to get a dried Rice Krispy off of the floor? Well, I have. Thank god I don’t bother with manicures, or else our floor would be a minefield of dried krispies. 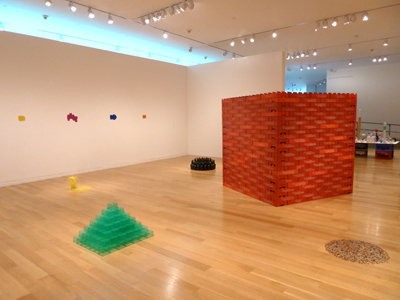 I stopped by the deCordova museum to see the work of Tony Feher. Now, let me just preface this discussion (one sided, of course) by noting that I am not usually very interested in found object sculpture. I know…I’m a philistine. 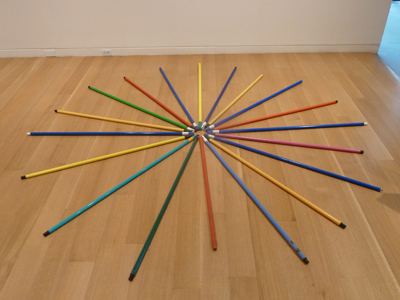 Anyway, so I wasn’t sure what I was going to think of Feher’s work. Each piece is quite simple, typically using only one or two types of objects, but the reconfiguration is fascinating. I love this too. 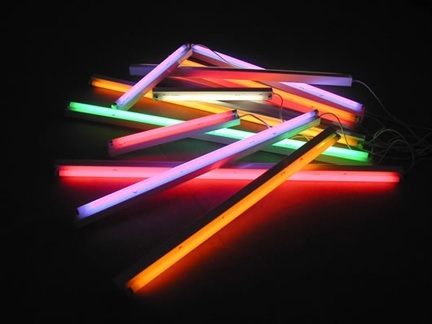 It makes me think of a Dan Flavin piece that’s turned off and seen during the day. 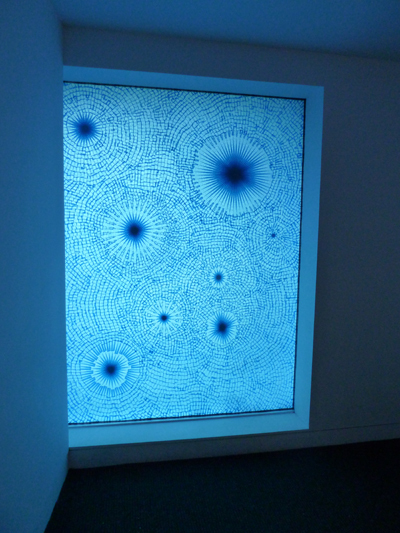 I’m sure that you’d rather see more of Feher’s work, rather than my bizarre and boring associations. Fine. 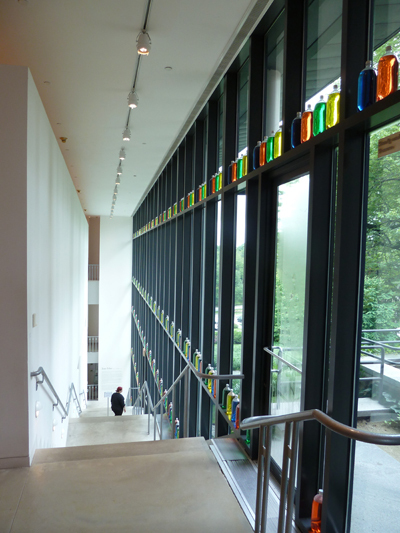 This is Feher’s installation in that great stairway at the deCordova. This space is pure genius (thanks to William Rawn Associates), as it creates this really unusual installation space. I love seeing what different artists do here. Feher has taken two liter bottles and filled them with colored liquid. It’s often hard to get a good photo of this space, as it’s so narrow. It’s 21st century stained glass, right? 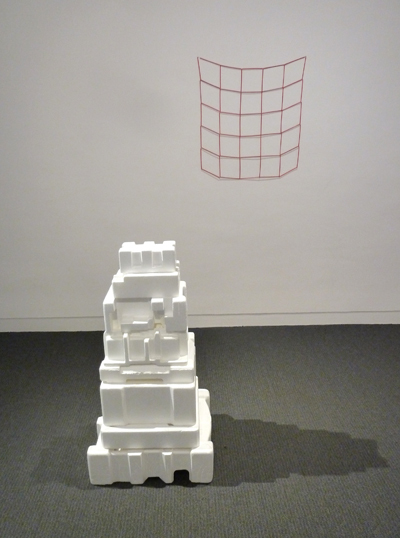 Yes, you are looking at a tower of styrofoam packaging. 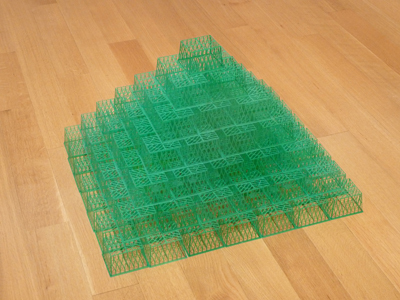 I can’t help but think of an architectural model…perhaps for the New Museum in NYC? Hell, Yes! (that expletive relates to the New Museum…I’m not normally so brash.) The grid in the background is made from plastic straws and polyester thread. BRILLIANT! I love how simple and elemental his pieces are. I love how these mundane objects feel truly transformed through their reconfiguration. He doesn’t cut/break/bend the objects…he just puts them together so that they form a new, single object. There’s such clarity to his work. Speaking of clarity…oh wait, I never have clarity. Nevermind. I’ll segue by my household’s own transformation of the mundane into…well, it’s still all mundane. My son is obsessed with Godzilla. A friend of mine is moving to TX, and she let me take some of her boys’ old toys. WELL, we got a small Godzilla set…and the rest is history. 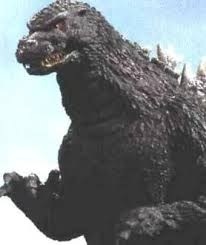 Godzilla is the perfect combination of dinorsaur-ish creature PLUS a force of ridiculous destruction/demolition. Greaaaaat. Let me describe this for you…the lower left has a monster truck parked next to a skyscraper. 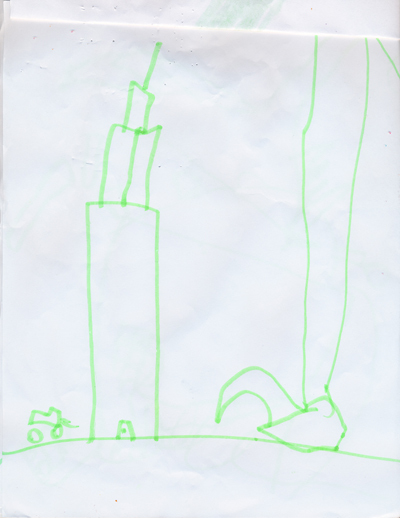 The tall thing on the right is Godzilla’s leg, with monster toenail. Yes, he’s SOOO HUGE that he can’t even fit on the page. Priceless. I’m also hoping that my toenails did not provide inspiration for this drawing…sigh.